Little Rara Noodle House is just around the corner of my office and I finally drop by to have a sample of what my friends dubbed as 'Boat-Noodle-Only-Better'. It's right opposite of Tune Hotel Chow Kit. By the way this is their third branch after Jalan Kia Peng and Hartamas. I had quite high standards for Thai food just because I'm raised with authentic Thai cuisine at home. Little Rara offers limited menu which I totally dig because they are focused with what they do best (logically). The ambiance of this particular branch is warn and inviting. 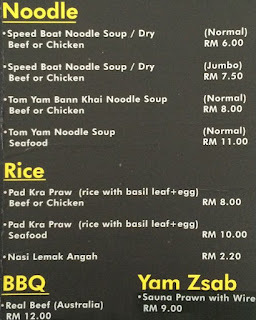 So we ordered Speed Boat Beef Noodle Soup, Pad Kra Pau Beef and Kai Thod Patong (Pulut Ayam). Here's the normal size. With Jumbo, you'll get extra meatball and shredded meat. The soup tasted okay, just like the one at Boat Noodle. They do have the condiments like fish sauce, chili flakes, chili vinegar and sugar for you to add in yourself to enhance the flavor. 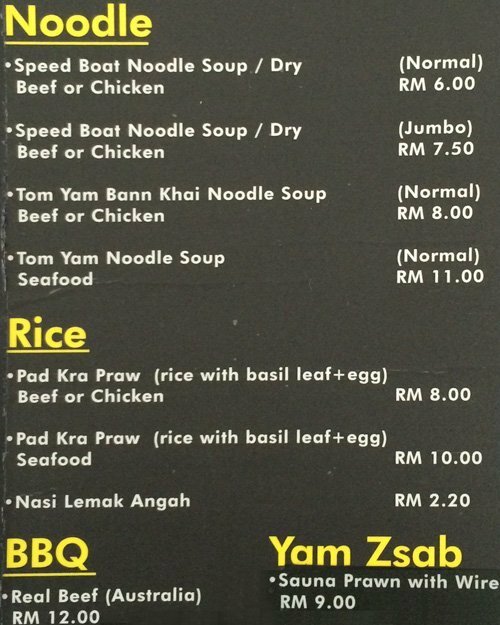 There are significantly more noodles than Boat Noodle's version but that's to be expected looking at the price point. I really really love Pad Kra Pau so this dish is a must for me. Sadly, it is not up to par with my expectation. The beef - quite dry, a bit salty and lack of the quintessential quality of a good Pad Kra Pau - the basil leaves. Such high hopes for this one. The fried shallots are great. The glutinous rice (pulut) were soft. I do hope they'll give more portion of the pulut though. The chicken were big and scalding hot so you know they fried it upon order. The taste, is quite okay. For RM8, I think its over-priced. After all this I've got to say, I'm team Boat Noodle. I do know that some of my friends swear by this place. You should try it for yourself and decide. You may prefer Little Rara after all. But I'll try other menu in the future. People said their tom yam is to die for!